My family has always had a strong attraction to potatoes of all kinds. 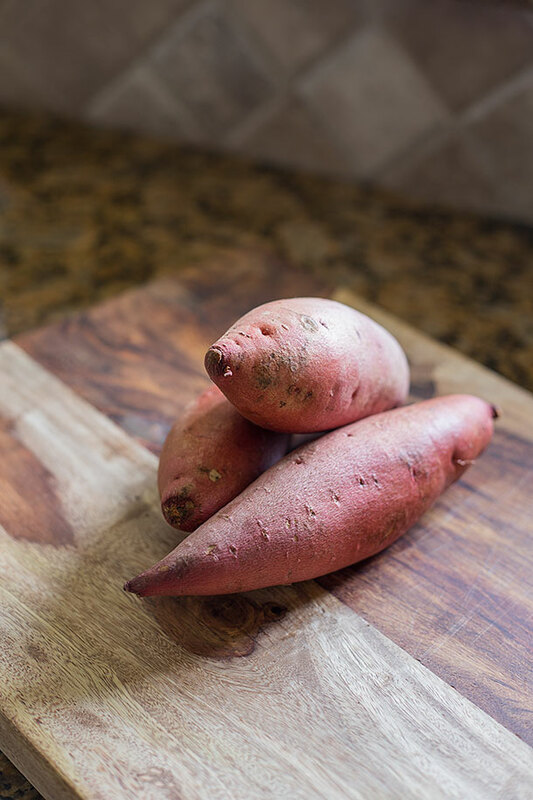 Among all the many types of starchy root vegatables known as potatoes, sweet potatoes would seem a more seasonal thing. That is until I realized the nutritional benefits compared to regular potatoes. 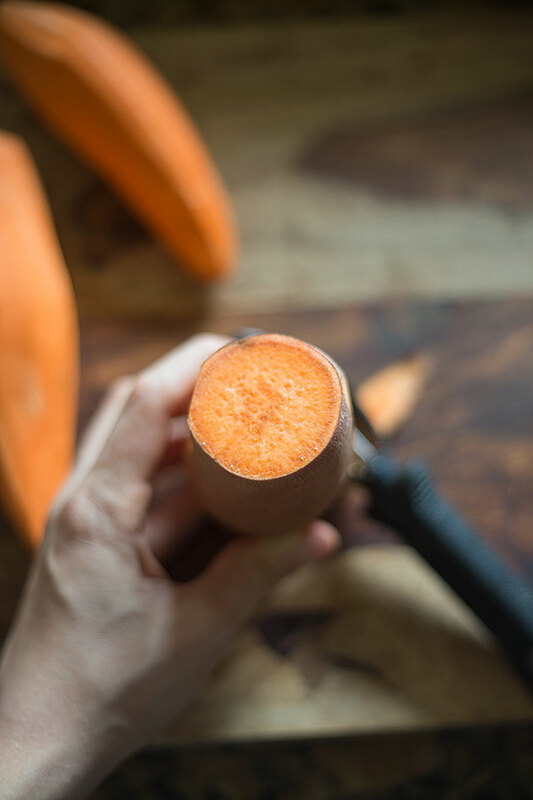 I’ve personally never been a fan of the sweetened up type of sweet potato dishes out there and not just because I abstain to eating processed sugar but I just find it too sweet. If I’m going to be eating a savory main dish then I want a savory side to go along with it. Just because sweet potatoes are moderately sweet doesn’t mean you can’t make them savory. 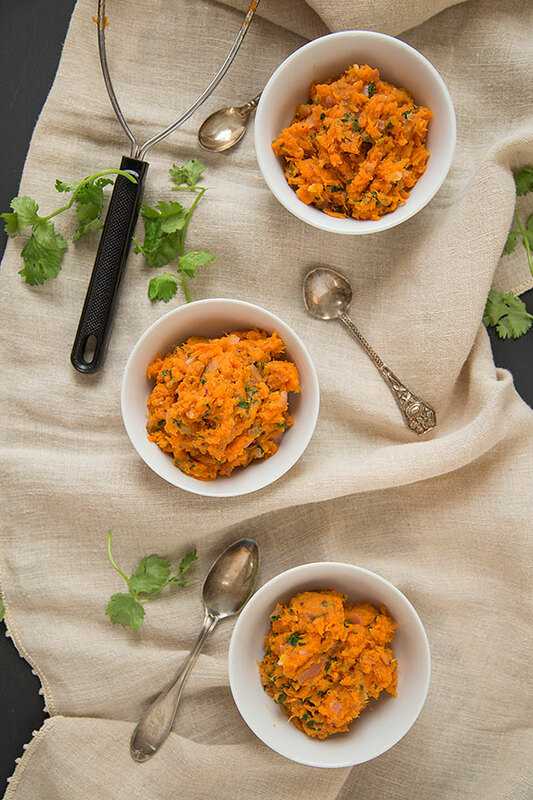 I love making different savory types of sweet potato dishes like my Spiced Sweet Potato Rounds. While I do love that dish, this one is my favorite to do because it has such a unique flavor that goes really well with a wide variety of dishes, especially a nice steak. This is best served fresh but holds it’s flavor surprisingly well in the fridge. Often times I find myself making it ahead of time and stuffing in the fridge for after my WOD. Although since it’s so incredibly easy to make it’s slightly unnecessary to make it ahead of time. You can simply use the same pot the whole time, which is a huge time saver and dish saver because I always seem to have a massive clutter of dishes every time I’m done in the kitchen. It’s actually kind of ridiculous because no matter how much I try to tidy up as I cook it just seems to continue to clutter in the same spot that I just cleared of cooking utensils. I remember hearing Gordon Ramsay once saying that an important trait of a chef is cleanliness so I might need to work on that just a tad. Which actually brings me to the fact that I don’t necessarily want to be a chef even though that’s what a lot of people assume of me. 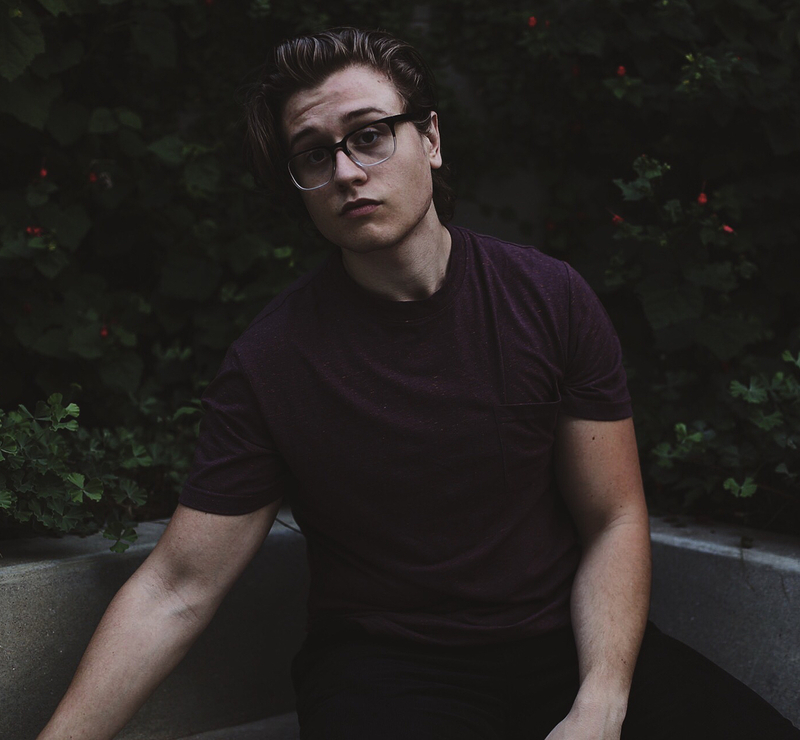 If you’re wondering what I want to be or what I want to do, since that is seriously on my mind now that it’s my senior year in high school I can tell you now that I know just about as much as you do. I have absolutely no idea. Especially since my senior year in high school is coming up in two weeks and I can hardly think properly. One subject enters my mind and a completely different one exits. Hopefully everything get’s a little more clear as the days go by but I’m not exactly looking forward to going back either way. Not to mention waiting in line for two hours to get a parking sticker. I would much prefer a high school that focused on food, specifically good food. Yeah, let’s work on that. 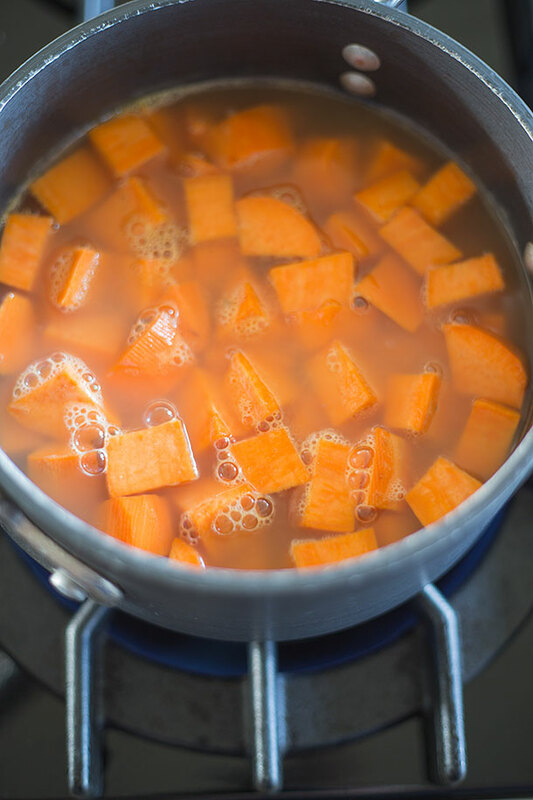 In a medium pot bring chicken stock to a boil over medium high heat then add sweet potato and season lightly with salt and pepper. 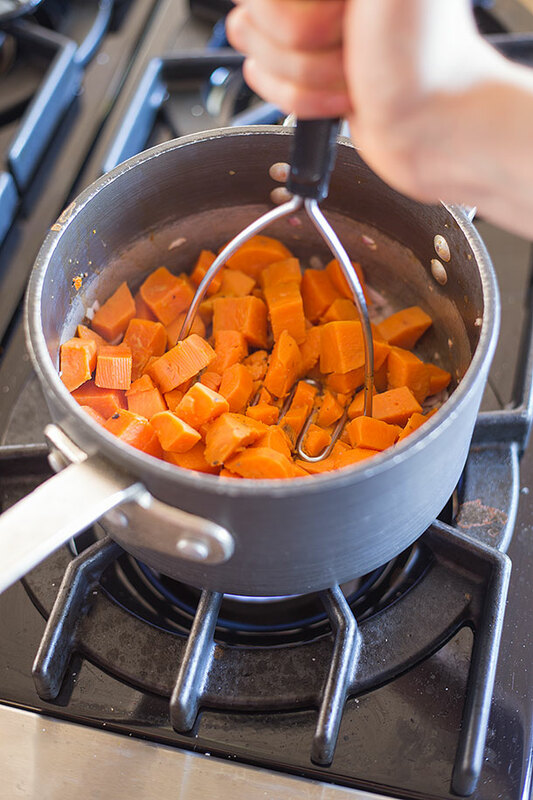 Boil sweet potatoes for 10-15 minutes or until easily pierced with a fork. Strain out the chicken stock through a mesh sieve or colander in a heat safe container and store in the fridge for use later. Make sure your pot is dry in the bottom then place back on the stove and heat 1 tablespoon of butter or ghee then add shallot and garlic and saute for 2-3 minutes. 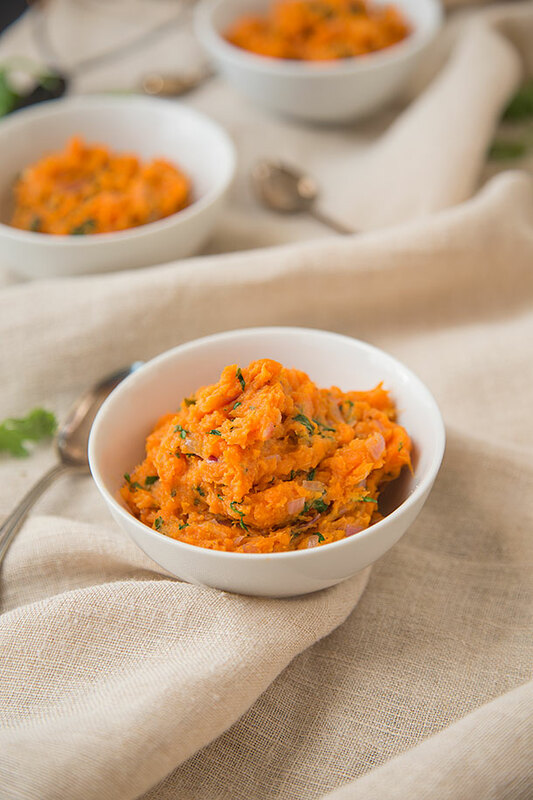 Add boiled sweet potatoes and mash with a hand masher then add remaining tablespoon of butter or ghee along with the sage and cilantro, season with salt and pepper to taste and continue to mash until thoroughly incorporated. There are a lot of things you can do wIth the chicken stock left over that you strained out. I like to store it in the fridge and use it again for the same recipe with a little bit of water added to get it back to full 3 cups or use it as a base to a sauce. It adds an interesting slight sweetness from the sweet potatoes that were boiled in it. Hi, I also grew up with the “boil the yams, add brown sugar then mash; add marshmallows on top and bake” variety of sweet potatoes/yams. Thank you for the seasoning ideas. Yep, even when I ate poorly I still didn’t like those. There are too many amazing savory ways to handle sweet potatoes to have them made like that in my opinion. This sounds soooo good! I have never thought of using stock to cook sweet potatoes in – will try this! My senior year is coming in one week, and yes I have absolutely no idea what I want to do too. Maybe something to do with baking .. But that’s the future thing, I have to try this recipe first!! No kidding. It’s my senior year in high school so now everyone is freaking out about applying to colleges. Kelly, I’m 62 and still don’t know what I want to do. I’ve done a lot, but am still searching for what I want to do. Don’t let me scare you…I believe things are put in front of you to do and you just do them. One day, I hope we both get to do what we want to do. Cheers. That marshmallow/brown sugar mess is just nasty! I grew up with my mom baking sweet potatoes then whipping them with butter. That’s all. I found a recipe that was similar to what my mom did but with adding nutmeg or some such. It adds a bit more flavor. I find that baking the sweet potatoes gives them more flavor than boiling, but using chicken stock, hmmmm. I’m going to try this one. Another favorite, no-brain, way to cook them is to cut them in half and bake cut side down in melted butter. I do that when I am making a meat dish in the oven. Cooked long enough, the edges caramelize and are delightful! My husband prefers white potatoes, so I cook them both this way. This is delicious! I love it because it tastes good and is packed full of nutrients. Your recipe gave me instructions I could follow easily. The photos are great. You were careful to include details such as “make sure the pot is dry on the bottom.” I also liked the tip for using the extra chicken stock. This recipe sounds great, but seriously, you haven’t had savory sweet potatoes until you’ve seasoned them with cumin and cayenne pepper. On days when I need a high carb/fat, that, along with an avocado, is my go-to meal. I have to avoid nightshades, so the shallot and garlic is out for me. But thanks for another way to entice my dad into eating sweet potatoes. Holy crap, I just found your site via Against All Grain, and will not probably blow the rest of the afternoon reading back entries. Good one. Diana: I totally agree. I happened on this site by accident today. Everything I looked at so far seems scrumptious. It may just become my new obsession! This dish sounds delightful. I have a sweet tooth, but I also hated those yams smothered in marshmallows and brown sugar. Overall, sweet potatoes always seem so complicated to cook. I used to mash carrots with my potatoes sometimes (and gross out my room-mates), so I like the idea of the striking orange color, familiar texture, and beloved ingredients. Anything that has the consistency of my favorite comfort food with real butter and herbs sounds like a winner in my book. The fact it is chock full of nutrients is a bonus. I have to find a way to incorporate more vegetables in my diet. I’m pretty sad as a vegetarian. I hate mushrooms and tofu. The texture of both truly grosses me out as does food products made to taste and look like meat. If I wanted the latter, I would eat the real thing! Salads are only good when slathered with a dressing of some sort. I am an extremely picky eater, and have always been a bit of a starch-etarian. I love bread, crackers, pasta, potatoes, rice, corn, etc. 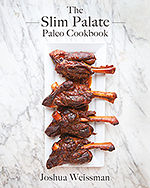 I have been exploring paleo related cuisine as a way to cut down on less nutrient dense carbs. I adore dairy (and wish I could live on butter and cheese). Eggs and beans are a saving grace, but they can get boring too. Luckily, I live in an area that abounds in farm fresh herbs and veggies. 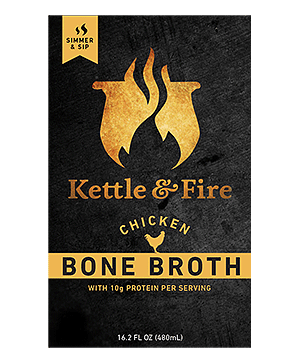 I haven’t had beef/chicken/fish in a couple of decades, so the stock is out for me. Maybe I will bake them first as someone suggested so that they are more flavorful than boiling in plain water.